Every year, at the start of January, the Wellcome Library opens various archive items to the public that have been closed under the Data Protection Act until this point. As usual, this year’s collection of expired closures is widely varied, the subjects spanning madness, animal experimentation, the skin pigmentation disorder Argyria, and the discussions of Allied leaders during World War II. The items’ formats include patient records, personal diary notes, fellowship applications and organisational subject files. But what do any of these have to do with the opening words of The Sign of Four, possibly the best-known depiction of drug use in English literature until Trainspotting came along? He is described as being normally rather reserved, and has done some good work painting, his portraits having been accepted by the Academy…. Broke down last spring and became irritable & excitable. Taken by Dr Lord to his “home” at Hampstead, then began to smash things, & threaten, and evidently in a condition of absolute insane excitement, was certified & sent to the Priory. I wish I c[oul]d have some more brandy: it is like being in prison to be deprived like this of ordinary necessities. Also if you c[oul]d lend me a hypodermic syringe I s[houl]d be very much obliged. Last night, the morphia bottle was not found in my room: so Mr [illegible] refused to give me a dose at all: this, I regard as the most monstrous piece of insolence in a paid [illegible] I have ever heard of: but not by any means the only bit of impertinence I have been subject to. The morphia you have given me has had no effect at all. Mr Savage said definitely that I was to have it in doses strong enough to have some effect. I have told you over and over again that I have to take morphia in larger doses than people who are not accustomed to it: but you never attend to anything I say. For heaven’s sake send me some brandy or something, I never felt so ill in my life. If I had been at my own home I c[oul]d have put myself right hours ago. But the link to Sherlock Holmes? Although the doctor making notes on Kerr’s admission concentrates on his portrait work, Kerr was also a book illustrator of some note, providing pictures for works by Rider Haggard, Robert Louis Stevenson – and Conan Doyle. In fact, when The Sign of Four, with its vivid opening depicting intravenous drug use, was published in 1890, it was with illustrations by Charles H.M. Kerr. 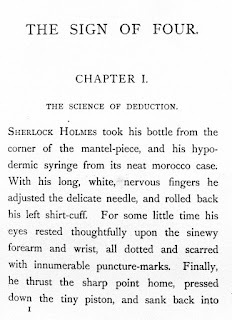 Holmes’s drug of choice is said to be cocaine rather than the morphia Kerr uses, but Doyle does make a reference to “the drowsiness of the drug” when talking of cocaine use in a way that suggests this is one of his notorious errors of detail and that, at least sometimes, Holmes should be seen as taking morphia. Does art imitate life in this case, or life imitate art? Did the illustrator work on a text describing a dependency he knew only too well, or only later fall victim to the same addiction? The case-notes await work that would flesh this out. What is only too clear is that the two addicts had different fates: Holmes, famously, is weaned off his drug-use by Watson, but Kerr has a less happy end. On September 8th 1906 he leaves the Manor House for his wife’s care, noted as “Discharged ‘Relieved’”, but a note below this comments “Died at Burgess Hill, December 1907”, a little over a year later. There was a good deal of talk last night about the afternoon Conference at the President’s house. Everyone thought he had gone to bits physically and there was much speculation ab[ou]t the cause. It was at [illegible] that I first realized there was something wrong and that he was losing weight. Now anyone can see that he is a very sick man. It is not only his physical deterioration that they notice. He intervened in the discussion very little, his mouth dropped and he seemed to have little grip on things. He has al[wa]ys been short of knowledge about the subject under discussion but his shrewdness as covered this up to the present. Now, they say, the shrewdness is gone and there is nothing left. This is one of only three items from the Moran papers to be opened this year, but these few are the prelude of a long series to come: January 2011 will see twenty-one items from that collection newly opened. Fascinating revelations can be expected. From addicted artists to the corridors of power: the full varied list of items newly opened is given below. Readers are warmly invited to visit the Library and enjoy the sensation of being among the first people to read these papers for decades. MS.6334 Ticehurst House hospital: patient Certificates and Notices: Admission dates 1905-1909. All are described in the Archives and Manuscripts catalogue: simply search on the reference given at the start of each entry. 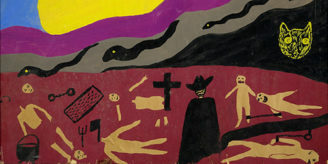 Illustrations: the upper illustration shows the first page of The Sign of Four. The lower shows Lord Moran aboard a ship. 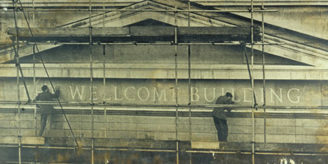 The Wellcome Library also has David Owen's 'In sickness and in power: illness in heads of government during the last 100 years' (http://catalogue.wellcome.ac.uk/record=b1665066). Partly researched at the Wellcome Library, this book touches on related themes.